"Netwrix Auditor is the excellent tool all IT personnel and IT auditors need in order to better maintain their network infrastructure and get quick and accurate insight into device configuration and changes." The free edition of Netwrix Auditor for Network Devices monitors network devices for configuration changes and logon attempts; catches scanning threats before attackers can take control of the network; and simplifies detection of hardware failures so you can quickly troubleshot network traffic issues. 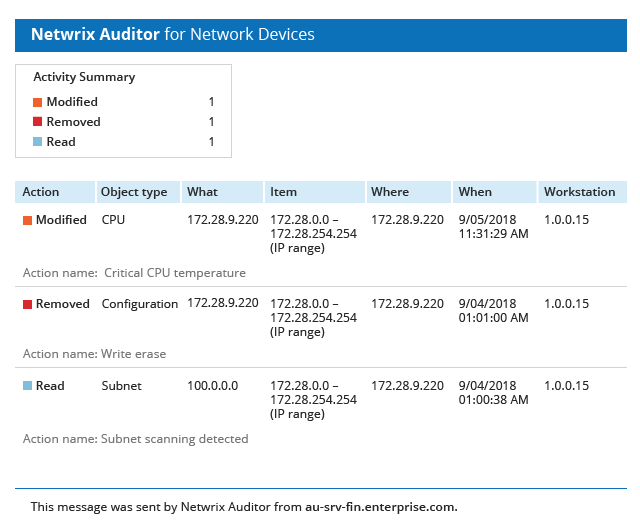 Unlike other free network audit tools, Netwrix Auditor sends daily reports detailing the critical events that happened during the last 24 hours to help you streamline network device security auditing. Delivers meaningful data about changes, including when and where each change occurred and exactly what was changed. Monitors remote and direct user access and provides clear information about both successful and failed attempt to log on to network devices or gain VPN access to the network. Makes continuous hardware audit easy by reporting on hardware issues in network devices in an easy-to-understand format. Collects and aggregates data about user activity from multiple network devices and automatically reports on it by email on a daily basis. Eliminates the need to analyze noisy native logs by providing information in a human-readable format. Relieves you from extra expenses or painful budget approvals and will never expire or stop working when you need it. Without proper network security tools, the analysis of native logs takes a great deal of time and effort to spot activity that could lead to connectivity issues or make the entire network unreachable. This edition of Netwrix Auditor, unlike other network security audit software, is free of charge and provides actionable audit data on critical events, such as firewall configuration changes, network scanning threats, and failed logon attempts by database or server administrators and other users, enabling organizations to respond to these events before they can damage network security, performance or availability. This free network auditing tool makes it easy to establish continuous security monitoring of your network and ensure that the activity of users is in line with established processes and controls. It is essential to track user actions because any improper change, whether deliberate or accidental, can create network vulnerabilities that could lead to a wide range of security incidents, from loss of internet connectivity or application downtime to a successful cyberattack. "Netwrix Auditor allowed us to gain a better view of what is going on in our constantly growing IT infrastructure. It also enabled us to increase accountability within the department. Finally, Netwrix Auditor is great at the operational side of things — it saves the company hundreds of hours a year on resolving user issues." Netwrix Auditor for Network Devices is quick to download and has a smooth deployment process. Check out the table below to find out whether your IT infrastructure meets the minimum technical requirements.